Though beacons are popularly touted as a retailer-focused opportunity, of late marketers across various verticals, such as stadiums, airports, malls, casinos etc, are betting on iBeacon technology to help enhance customer experience. According to a recent Adobe research, 18% of marketers are reported to be actively testing and deploying beacons, and the numbers are expected to double in 2015. Though, beacons have today reached mainstream, most brands are still unsure about how to leverage beacons and integrate it with their mobile strategy. Even those marketers who are well aware about proximity marketing and its ability to help drive sales, aren’t sure about where to begin or the kind of campaigns they can implement with beacons. In their haste to catch up to the hype and glitz around iBeacon technology by kick starting their beacon strategy, a number of brands are getting caught up with unsuccessful attempts. In this post we will discuss about 2 dissapointing beacon trials, reasons behind these and how to hit the right note with beacons. What was the beacon trial all about? During the Melbourne Festival in October, Arts Centre Melbourne leveraged beacons to promote its cafes and bars and ultimately drive sales by alerting visitors about food and beverage offers at the venue. The centre allowed visitors to use iProximity’s beacon to download coupons from their iPhone and store it in their Passbook. When visitors with coupons stored in their Apple Passbook walked by a cafe or bar, beacons triggered the coupons to pop up on their screen, asking them if they wanted to redeem it. As a result, while the Arts Centre offers were downloaded an impressive 515 times, the number of redemptions, where a customer takes up an offer were very low. 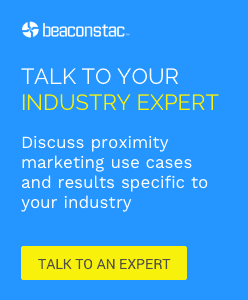 When it comes to beacon marketing, not every industry functions the same way. One of the biggest mistakes made by Arts Centre Melbourne in this beacon campaign was that they tried to replicate a retail approach in a cultural arena. A theatre experience isn’t all about buying beverages or food at the venue, it essentially revolves around performances showcased at the centre. Therefore, unless you leverage beacons to add value to the visitor experience at the cultural institution, there is bound to be a disconnect. Another important thing here is that, the Arts Centre did not use an app of their own for the beacon trial. Something that isn’t uncommon today, as being unaware of how to launch their own beacon campaigns, a number of businesses are now turning to beacon ad networks. However, one factor that most businesses miss out on is that, when it comes to beacon ad networks, the ownership of content and experience lies in the hands of the network and not the business. This way, not only does the business lose out on the chance to personalize content, to learn from their visitors’ behaviour and use such insights to strengthen their sales, but also end up bombarding their users with unnecessary notifications. What lead to the failure of Arts Centre Melbourne’s beacon trial? – Play trailers of shows – You could allow visitors at the venue to scan performance posters on the walls, which in turn would trigger the corresponding app to play trailers of the show involved and to display the times when the performance will be showcased. – Proximity alerts and ticket purchase – You could use beacons to trigger proximity alerts on the details of performance screening times in the users’ mobile devices with the corresponding app, when they are near the venue. You could also allow your users to purchase tickets directly from the app. – Post-performance content alerts– You could use your cultural centre app to unlock interactive content about the production that they just saw in a diverse range of formats such as audio, high-resolution images and information. Not only will such content give visitors a deep insight into the experience that they just had, but also create a strong customer relationship between the visitors and the cultural centre by allowing visitors to take the content home with them. – Provide improved parking facilities – Finding a parking space can often end up being a taxing task. Most cultural centres have no way of letting visitors know if the parking lot is full before they enter the venue. Thus, most visitors drive in only to end up circling round and round in vain looking for a spot. But with beacons, as soon as a visitor enters the parking lot of the cultural centre, you can trigger a notification about the number of parking spots available and direct visitors to the nearest one. Virgin Atlantic recently began trialling iBeacon technology in the Upper Class Wing at London’s Heathrow Airport. As a part of the trial, premium passengers of the airline who opted to download an Apple Passbook boarding pass were allowed to receive personalized notifications and offers via their iPhones. Virgin leveraged beacons to alert travelers to keep their electronic boarding passes ready when they were near the private security check area. This was done by allowing the passengers to open up their boarding pass by swiping on a direct link on their mobile screen.The airline also used beacons to push tailored offers like commission-free currency exchange deals to passengers as they passed by the MoneyCorp currency exchange booth at the departure area of the Heathrow airport. When it comes to leveraging beacons, one of the biggest challenges faced by businesses is getting consumers to download the proprietary app. Most businesses today are tackling this problem by tying up their beacon strategy with Passbook, an existing ‘utility’ application on Apple devices. The primary advantage here is that, it does not require your consumers to download a third-party app. They can just add a store-specific pass or loyalty card to their Passbook and once they are in the venue, businesses can detect a user’s location using beacons to trigger various messages and offers through their ‘Passbook’. This saves businesses the hassle of creating their own app. Virgin Atlantic opted to take this easy route. However, Virgin Atlantic opted not to extend this trial because of low passenger adoption rates. Another important factor is that today, though most travelers already use beacon powered mobile apps for on-the-go guidance, be it at the airport, destination hotel or major attraction sites, the information is spread across multiple apps. For example, with the Virgin Atlantic app, The James hotel app and the New Museum app, installed on his/her mobile, a traveler already has three different pieces of information to process. Although this is not touted by many as a major ‘can’t do without’ factor, it does result in bad user experience for the connected traveler. – Integrate with contextually relevant third-party services – For businesses to utilize the power of contextual relevance to it’s fullest potential they need to look for relevance beyond their own doors. This can be done by contextual integrations with relevant third-party services. For example, an airline app that can integrate with a a car-rental service or Uber app for airport transportation and traffic data thus helping passengers plan their travel ahead. This allows airlines to provide value to their end-users beyond just their service. – Luggage Tracking – Airlines can leverage beacons to enable luggage tracking for passengers. Upon arrival at the airport, each passenger’s luggage can be tagged with the airline-branded beacon which in turn allows passengers to receive notifications, confirming the entry of his or her checked luggage at the baggage claim and their arrival at their destination, through the airline app. It also allows the airport’s logistical team to keep a check on luggage from going missing by sending alerts when a piece of luggage falls off one of their sorting belts or baggage carts (which will be equipped with a sensor). – Support for the differently-abled – Passengers with special needs can be offered better services through beacons. Beacons help airlines provide passengers with motion disabilities, hearing difficulties and those who are visually challenged with additional information based on their needs, thus ensuring that they can navigate with ease. Further, by asking differently abled passengers to wear beacon attached wrist bands, airlines could help their staff easily identify if a particular passenger in a crowd needs special attention. – Enhanced Analytics – According to recent reports, non-aeronautical sources accounted for 47% of revenue earned by airports. Beacons can be used by airlines to develop a deep understanding of the navigational patterns of passengers within the airports such as the areas where they dwell the longest. Once airlines have this information in place, they can use it to plan better entertainment, retail and dining layouts around the interests of the passenger as the main focus.